Habit: Annual to subshrub, from taproot; stem often thick and fleshy. Leaf: basal and/or cauline, alternate, simple, narrowly elliptic to narrowly lanceolate, pinnately lobed to occasionally entire. Inflorescence: loose wand-like spike. Flower: opening at dawn; hypanthium short, +- with a lobed, red-brown, fleshy disk within; sepals 4, reflexed (occasionally 2--3 remaining adherent); petals 4, yellow, finely flecked with red near base, this area not ultraviolet reflective, remainder of petals strongly so, fading orange-red; longer stamens opposite sepals, anthers attached at middle, pollen grains 3-angled; stigma +- hemispheric or cylindric, generally > anthers and cross-pollinated, or +- = anthers and self-pollinated. Fruit: straight to curved, sessile. Seed: in 1 row per chamber, narrowly obovoid, finely papillate, generally purple-spotted. Species In Genus: 4 species: 3 in Baja California, 1 from west-central California to western and southern Arizona, northwestern Mexico. Etymology: (Greek: well lobed) Note: Incl in Camissonia in TJM (1993). Habit: Annual, +- glabrous or leaves minutely strigose, inflorescence sparsely glandular-hairy; rosette well developed. 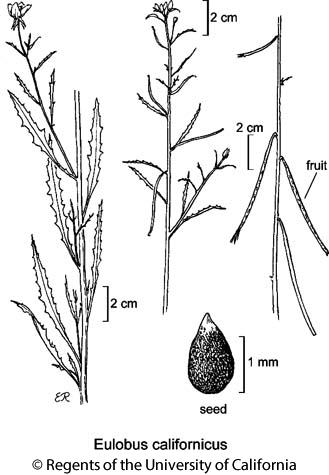 Stem: erect, straight, 2--180 cm, slender, +- glaucous or green. Leaf: < 30 cm, narrowly elliptic, irregularly and sharply pinnately lobed, much reduced distally on stem. Inflorescence: flowers widely spaced. Flower: hypanthium 0.6--1.5 mm; sepals 3.9--8 mm; petals 6--14 mm. Fruit: reflexed, 45--110 mm, cylindric early, drying 4-angled, +- straight. Seed: 1.3--1.6 mm, olive-green, purple-spotted. Chromosomes: 2n=14,28. Ecology: Open places in coastal-sage scrub, chaparral, desert scrub; Elevation: < 1300 m. Bioregional Distribution: NCoRO (Sonoma Co.), SnJV (Fresno Co.), SCoR, SW, D; Distribution Outside California: southern and western Arizona, northwestern Mexico. Flowering Time: Apr--Jun Note: Self-pollinated. Citation for this treatment: Warren L. Wagner 2012, Eulobus californicus, in Jepson Flora Project (eds.) Jepson eFlora, http://ucjeps.berkeley.edu/eflora/eflora_display.php?tid=25362, accessed on April 19, 2019. NCoRO (Sonoma Co.), SnJV (Fresno Co.), SCoR, SW, D; Markers link to CCH specimen records. Yellow markers indicate records that may provide evidence for eFlora range revision or may have georeferencing or identification issues. Purple markers indicate specimens collected from a garden, greenhouse, or other non-wild location.